I’ve discovered a few secrets on how to take control of my life and pursue my dreams. First, have you defined your dreams? If not, write them out. Make it specific and concrete. Write out a few steps you can take right away. They can be baby steps, not huge leaps. Second, after you’ve written down your dreams and goals do you find that everyday life gets in the way? I’ll sit down and write or make that phone call — after I unload the dishwasher, sort the laundry, and weed the garden. Plus, the car needs an oil, lube and filter. Then, I’ll get started on my dreams. Third, is it fear that is holding you back, not life in general? Why aren’t you following up on your baby steps? Take a close look at what you’re doing, or what you’re not doing and ask why. Here are my tips on how to overcome my fears and reach for my dreams. I revel in my routine. I was talking about routines with my husband this morning. He said he believes all mammals crave routines. For example, Olive, our cat, leads a structured life. She stays out all night. She wanders in announcing her arrival with three short little mews at the same time every morning and then jumps onto my tummy. She meows a little louder and wants me to walk her to her food bowl. Minutes later, after I’ve snuck back into bed, she’s back on my tummy for a kitty dance before she settles in for the day. At this point, I have to slip out from under the covers without disturbing Olive, to start my morning routine. My routine involves writing three pages longhand every morning of every day. This clears my mind so I’m open to new creativity. It serves as a brain dump to get those niggling uncomfortable thoughts out into the daylight. Some days my morning pages are a long to-do list. The few times that I’ve missed my morning pages I’m anxious and jittery. The second phase of my morning routine, besides the basics of toothpaste, floss and face cream, is to walk. I walk two miles around my neighborhood and park, marveling at the beauty and how I get another chance to start fresh. I throw in a short stretching routine, sit-ups and pulldowns. Energized and refreshed, I’m ready to start my work. Another tip is to tackle those things that you don’t want to do–first. Get them crossed off your list and your day will open up. Fear and anxiety can be big blocks. When I take my fear head on I’m motivated rather than blocked. Anxiety is energy. I tell myself to harness and ride it toward my dreams. I have a sign in my living room that says, “Live now. 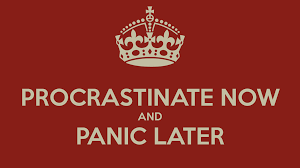 Procrastinate later.” Such good advice that I try to follow it. We may think we know what’s best for our children. But, allow them to find and follow their own dreams. This morning after the lanes were changed from LC to SC. I realized something this morning during my Masters workout. I really, really like long course. The irony is it’s the final week of long course training. I swam my first LC practice of the year Wednesday! I wish I would have begun months ago. Since there’s plenty of time to think and reflect with my face in the water, I realized it was fear that kept me from going to LC practice earlier this year. What else is fear holding me back from doing? Masters practice 100 x 1oo’s on New Year’s Eve. It’s almost humorous because I write about life lessons my kids have gained from years of swimming—and here at my age I’m learning life lessons, too. I began swimming US Masters a year ago, April. I was terrified and wrote about my first day here. Swimming was my New Year’s Resolution, yet it took me four months to get started. This past year, I swam in my first meet, learned to flip turn and dive off the blocks. Swimming has taught me to try new things, and don’t wait—or the opportunity will be gone. How to apply these lessons in the rest of my life is key. Another life lesson is to be consistent. It’s very hard and counter productive to start and stop, start and stop. It’s truly the “Tortoise and the Hair” approach that works in all we do. Slow and steady is much better than a sprinter who quits halfway through this race called life. At my first meet with my good friend, Linda. Whatever you want to do, whatever your dream may be—is there something holding you back? Is it fear? If so, what are you afraid of? My fear of LC was that I wouldn’t make it to the other end of the pool, or I’d have to quit before the workout was done. It turned out that LC is easier for me, I get a nice rhythm going, I’m more relaxed and confident swimming LC than short course. Who knew? Have you overcome fears in your life? What were they and what did you do? My son is leaving the nest, really moving away. This is different from leaving home to attend college. It’s a whole new world of parenting to have a college graduate—finally ready to be out on his own—and move away from us. Yes, it feels weird. He came home over the weekend for a visit and a hair cut. He decided to stop getting hair cuts more than a year ago. He said he had this one time in his life, while in college, to grow his hair long. I didn’t like it one bit, but I did not argue with him. Days of short hair for both my kids. I remember hair being a big deal in the 70s when I was a kid. My brother got suspended for having his hair reach his collar. My parents fought it and finally the school relented and hair restrictions were eliminated. A few years before that, girls couldn’t wear pants to school and jeans were against the rules for boys and girls, too! Isn’t that wild to think about? Two weeks before my son’s commencement ceremony, he drove home to get his locks chopped off. The length of his hair after the cut is still longer than it was during his 18 years at home. However, it’s a huge improvement over the “Robert Plant” do. After graduation, he’s packing his car and renting a U-Haul trailer if necessary. Then he’s driving north to the Bay Area to pursue his dreams. Wow. I am working hard to get my head around that. He looks healthy and happy and it’s now officially his life. My daughter and teammates at the Fran Crippen Swim Meet of Champions. My daughter has a big weekend coming up, too. This is after a week of getting perfect grades and an acceptance into Business School at her university. Her next momentous occasion is the meet at the Irvine pool. She’s trying for her lifelong dream of making Olympic Trial cuts. She’s been close for a couple years, but close doesn’t count in swimming–it’s not horseshoes. I’ll be a nervous wreck at the meet. I hope and pray she’ll reach her goals. But if she doesn’t, I know she’s resilient, hard working and will have more goals to swim towards. Most of all, I’m proud of the strong self-reliant adults my children have become! It’s been an amazing privilege to be their mom. With our girl after SMOC. One more meet to go!